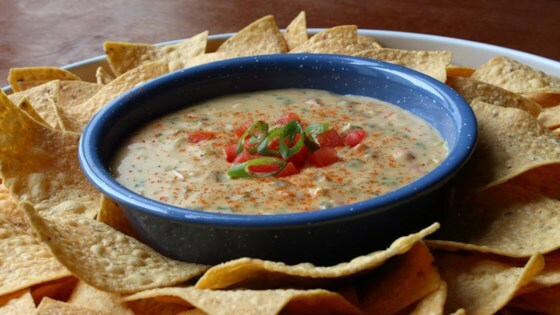 "I used to make something very similar to this queso dip at the Mexican restaurant I worked at in college, where we called it 'chili con queso.' At first I thought it could be thicker, but later I realized the saucy texture was the key to its addictive irresistibility. Instead of too much cheese piled up on your chip, we just get a beautiful, silky coating, and as soon as you finish one, you can't wait to dip another, and another, and another, until there are no chips left." Grate Cheddar cheese into a bowl. Sprinkle in cornstarch and toss to coat. Melt butter in a saucepan over medium-high heat. Add garlic and light parts of the scallions. Sprinkle in salt, chipotle, and cumin. Cook and stir until fragrant, about 2 minutes. Add green chiles and 1/2 cup tomatoes; cook and stir for 2 minutes more. Pour in evaporated milk and bring to a boil. Add the Cheddar cheese and stir just until melted; immediately remove from heat. Stir in cilantro. Season to taste, adding cayenne if desired. Garnish with reserved green onion parts and 1 tablespoon diced tomato. Any melted cheese, or a combination, goes great in this. Make sure you use a tortilla chip to taste for seasoning, as it already has salt on it. Since this doesn't get completely firm, even after cooling down, you can make this ahead of time, and just leave it out, although that can be a risky maneuver, as there may not be a lot left when your guests arrive. This is better than our local Mexican Restaurant offers. I made exactly as written, using half white cheddar and half mont. jack. It is so super easy and quick to make. This was a big hit with the family. Will be making this again. We ate it like nachos. Was really good with sour cream. Delicious. I didn't change a thing. Will make this often.